When Marsaili Campbell met Callum Grant, she was convinced she had found the man who would love her, protect her, and help her escape her controlling father's plots. Callum left her at her father's castle with a vow of forever and a promise to return for her but he never did and she later discovered he had already been betrothed to someone else. Three years later, when Marsaili learns that she was also betrayed by her father, she escapes from his dungeon where she's awaiting a forced marriage and sets out to find that which was stolen from her. But a kidnapping and a wager lands her in the middle of a Grant celebration and brings her face to face with the only man who has ever held her heart, the man she believes betrayed her, the only man who can possibly save her. Maisaili isn't the only person who was betrayed. Callum has grieved for three years after being told that the woman he loved had drowned. He had broken a betrothal for her and thrust his clan into war by doing so only to lose her forever. Only now, when he has finally come to terms with his responsibility to his clan and agreed to marry the daughter of a neighboring clan's laird, does he discover that the woman he believed dead actually lives. When she finally tells him about the desperate quest on which she has embarked he knows he has to help her. It doesn't take long for both Marsaili and Callum to realize that neither the desire nor the feelings between them have lessened. But with his clan's safety dependent on the alliance that his marriage will bring, which will he choose: his clan or the woman who means more to him than his beating heart? 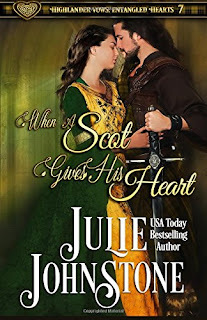 Medieval Romance is one of my favorite sub-genres and Julie Johnstone has become one of my favorite authors writing in this era. The books in her Highlander Vows:Entangled Hearts series are filled with intrigue, adventure, and deep emotion and When a Scot Gives His Heart is no exception. Fans of the series who have followed Marsaili's journey will be happy to learn more about her past and what has motivated her actions in previous books while readers new to the series should have no difficulty reading this book as a standalone. I've been intrigued with Marsaili since she was first introduced and have enjoyed watching the evolution of her character. Callum, on the other hand, is a new character but Johnstone takes time to give him the depth and complexity I've come to expect in her characters. I both ached for him and cheered for him. I liked Callum and Marsaili both individually and as a couple and was deeply invested in their journey and their happiness. They are honorable characters faced with potentially heartbreaking circumstances. As with previous books in this series, both the hero and heroine are presented with difficult, life-altering challenges and decisions and given no easy answers by the author. But, for me, that makes the book more interesting and the conclusion that much more satisfying. When a Scot Gives His Heart has my enthusiastic recommendation. The truth clawed its way up, and she worried she’d not be able to hold it in, so she did the only thing she could. She rose up on her tiptoes and kissed him. Her heart lurched as he stiffened. He was going to push her away! But a growl seemed to come from deep within him, and he delved his hands into her hair to cradle her head and slant his mouth over hers. The kiss tore through every defense she possessed. It was violent in its passion and blissful in the way it seared her from the inside out. Her hands had been clenched at her sides, but as his tongue slid inside her mouth and his heat consumed her, she could not hold back. She ran her hands up his thick arms to his shoulders and dug her fingers into the muscle there. Their tongues met, swirled, and retreated, as he ravished her mouth and her senses. Every memory she had worked so hard to repress flooded her. Each touch they had shared. Each kiss. The moment they had become one. She whimpered, when his lips found her neck, and then he stilled and jerked away. Oh, sounds like something I would really enjoy reading - thanks!! I've enjoyed all of the books in the series, catslady! Great review, and I would enjoy reading this, too. Hope you give her books a try, Diane. Also, I didn't mention this in the review but even though Marsaili is a continuing character in the series and I'm glad I read the books in order, Johnstone has written this new book in such a way that readers can thoroughly enjoy it without having read the previous books first. This is definitely a read I'll enoy. Thanks for your thoughts on it and the excerpt. I have not read her and have now added her to my wish list. New to me author and series. I love Scottish everything and anything. Sounds lovely. Sounds like an amazing read. Thanks so much for sharing this book and your review. 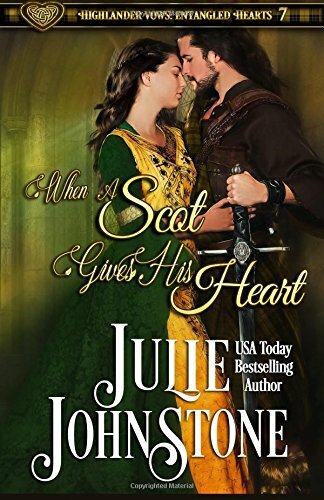 I love medieval highland stories (they were the first romances I read) and Julie Johnstone always delivers a good read.